Stepping Stones believes building healthy communities begins with healthy families. We advocate for people to break free from all forms of victimization by shedding the “victim posture” (the feeling that they’re powerless to change their lives) so they no longer live with abuse, violence, chaos, or instability. Our advocates skillfully walk a very fine line between upholding victim rights and validating traumatizing experiences, while helping individuals to courageously look at issues they can actually work to change. We, in no way, blame a person for what has happened to him or her, but we work to carefully examine those issues that may be keeping them vulnerable. Making a conscious decision to do the hard work necessary to truly change, and become free from all forms of victimization, is huge! With kindness and unconditional support, our advocates, help individuals to see that they don’t need to be victims in order to receive help and have their needs met. Upholding “victim posture” limits a person’s ability to become truly healthy, hopeful, and free. Shedding this posture, then, allows an individual to thrive and successfully become part of a healthy community. Create Healthier Boundaries. Creating healthy boundaries means you have control of who or what is allowed into and kept out of your life. You can choose to keep out toxic people, emotions, thoughts, and beliefs. It also means you can set and accomplish goals by eliminating anything or anyone that stops you from achieving your goals. The bottom line is you have the right to say what is and what is not acceptable for you. Build Healthier Relationships. Healthy relationships mean supportive fellowship of all kinds – friends, family, business associates, and romantic relationships. Shedding a victim posture allows you to identify areas that you have control over and can change, which leads to healthier relationships because YOU are healthy. Letting go of victim posture makes you better able to face challenging situations head on and deal with them honestly and openly, instead of avoiding them. Raise Healthier Kids. Violence and victimization are very damaging for children. Even if a child isn’t being hit, the impact of witnessing violence can affect physical, emotional, and intellectual development. This means adults are responsible for shedding victim postures for the sake of their children’s well-being. When children are growing up in safe, peaceful homes, they have increased opportunity to live healthier and happier lives. 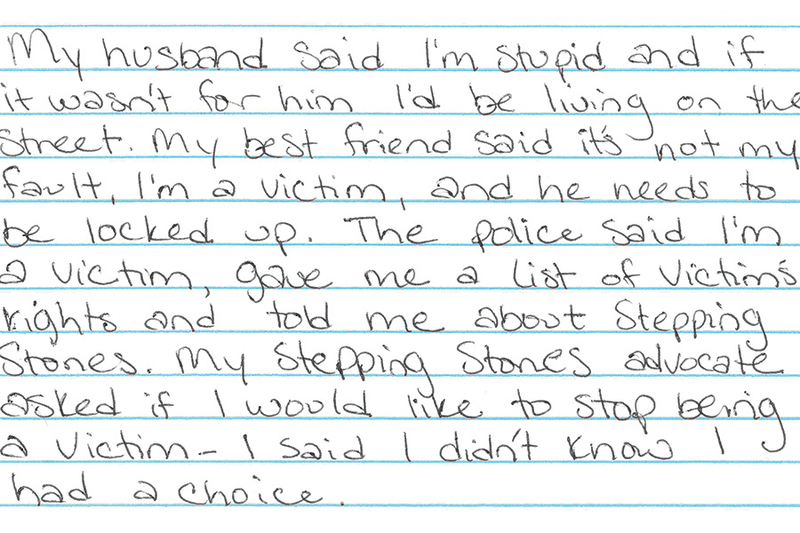 If you or someone you know wants to live free from victimization, call the 24/7/365 Stepping Stones Helpline to speak with an advocate: 928.445.HOPE (4673).